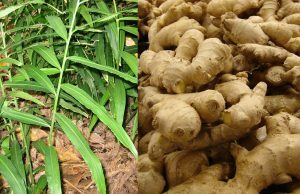 Synonym : Amomum zingiber L.
Vernacular Name : Ginger (English); Adarak (Hindi); Ardrakam (Sanskrit). Description : A slender, perennial rhizomatous herb; leaves linear, sessile, glabrous; flowers yellowish green in oblong, cylindric spikes, ensheathed in a few scarious, glabrous bracts; fruits oblong capsules. The rhizomes are white to yellowish brown in colour, irregularly branched, somewhat annualated and laterally flattened. The growing tips are covered over by a few scales. The surface of the rhizome is smooth and if broken a few fibrous elements of the vascular bundles project out from the cut ends. Distribution : Originated in the Indian subcontinent; now extensively cultivated throughout the world. Phytochemistry : Rhizomes contain α-Curcumene, α-curcumene, beta-D-curcumin; alpha-bergamotene, beta-camphene, gama-bisabolene, beta-bourbornene, d-borneol and its acetate, calamine, d-camphene, car-3-ene, alpha-cedrol, citral, and citronellol. Uses : Raw ginger is useful in anorexia, dyspepsia, pharyngopathy and inflammations; dry ginger is useful in dropsy, otalgia, cephalagia, asthma, cough, colic, diarrhoea, flatulence, anorexia, cardiopathy, pharyngopathy, cholera, nausea, vomiting, elephantiasis and inflammations.